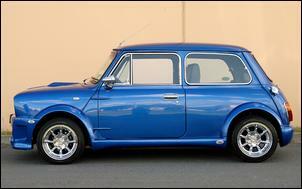 A 1978 Mini that packs a turbo engine and top-notch ingenuity! 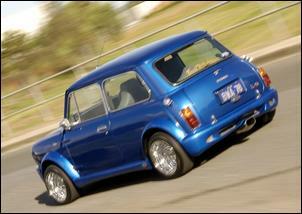 Lex Ansen tells us he wasn’t a crazed Mini enthusiast when he bought this 1978 Mini LS in 2001. He’d owned a couple of Minis years before but then he’d owned many other cars as well - Lex confesses that he tends to get rid of cars as soon as they get dirty! But the relationship with this Mini seems unbreakable. When Lex purchased this 998cc Mini LS for AUD$500 it was a typical unrestored example – a bit rough around the edges but free of significant rust. It was the perfect base for a build-up. Lex wanted a stand-out appearance, which he achieved with installation of a UK-sourced Zeemax body kit comprising a front and rear bar, nosecone, wheel arches and side skirts. Lex makes the point that the Zeemax kit is extremely strong – a contrast to some other kits that sag in the sun... The body kit has been custom-modified to accept a pair of fog lights and you’ll find Toyota Hilux front indicators, Holden Astra side indicators, bullet mirrors and a flip-type fuel cap. All of the panels were painted by Lex and his son in law using Subaru Rally Blue. It’s a very nice job. With the body now looking so schmick, Lex changed his initial plan to enhance the existing engine. That wouldn’t do the car justice. 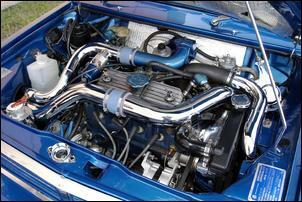 Instead, he tracked down a disassembled MG Metro turbo engine in the UK and had it imported to Australia. If you’re unaware, the MG Metro turbo engine is a 1275cc in-line four with a small turbocharger blowing into a single SU carby. There’s no intercooler fitted as boost pressure is kept down to around 4 – 5 psi. After modification to the non-crossflow cylinder head to enhance airflow and reduce the static compression ratio from 9.4:1 to 8.6:1, Lex reassembled the Metro engine. Aside from the compression change, the engine is internally standard. Supporting the turbocharged engine is a 16 row oil cooler with braided lines, oil catch can and a Super Cool 2-core radiator and header tank. Lex has also fitted extensive heat insulation under the bonnet to keep in-cabin temperatures down. A Mustang bonnet scoop and dual vents help in this. 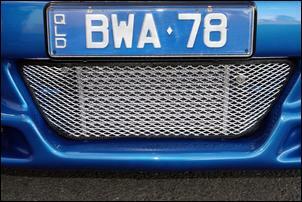 A second-hand air-to-air intercooler (from a Nissan S15 200SX) reduces the charge-air temperature that’s generated with a boost increase to 8 psi. 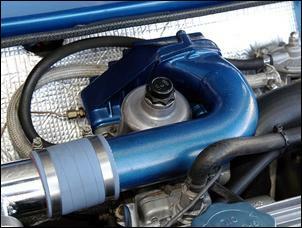 A TurboSmart blow-off valve is integrated in the chromed intercooler plumbing. 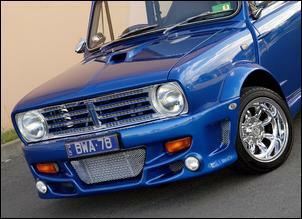 Brisbane ’s Motson’s Turbo and Suspension can be thanked for the intercooler set-up. The intake to the turbo comprises a high-flow K&N pod filter while the exhaust is a home-made 2½ inch system with an oversize tailpipe (which required enlarging the cut-out in the rear bumper). At the time of writing, Lex decided he’d had enough of trying to tune the carby set-up to provide suitable mixtures from idle to full power. The existing Malpassi fuel pressure regulator and Facet fuel pump are about to be replaced with a MicroTech programmable EFI system with a suitable high-pressure fuel arrangement. The associated MG Metro turbo gearbox and front diff handle the grunt of the boosted 1275cc donk. Lex says the gearbox is fine for applications up to around 12 psi. A heavy-duty clutch and quick-shift are fitted. The suspension is adjustable height featuring Koni gas dampers, front and rear camber kits and altered tie-rods to accommodate the wide wheels. And what are the wheels? Superlite 13 x 7 alloys imported from Germany . These wear Yokohama 175/50 13 rubbers – about as big as you can fit. Peer behind the wheels and you’ll find 8 inch ventilated discs and 4-pot calipers from the Metro Turbo while the standard Mini drums survive at the rear. Lex has whipped up a custom dashboard facia using 3-ply covered in foam and leather. This custom facia contains the standard Mini gauges alongside a standard double-DIN Holden/Eurovox head unit with Jensen speakers. 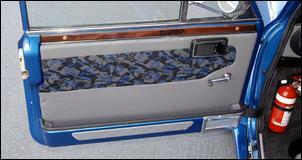 Lex’s timber work can also be seen in the neat glovebox panel and switch panel. This photo shows the custom door trims featuring Lex’s home-made timber highlight strips. Look closely at these timber strips and you’ll see the letters TURBO burnt into the timber – very trick! Other interior niceties include moulded plush-pile carpet, fabric hood-lining, Mazda map lights, aftermarket steering wheel, oil pressure, boost and water temperature gauges and a 3-stage knock display (marked Normal , Caution and Oops!). 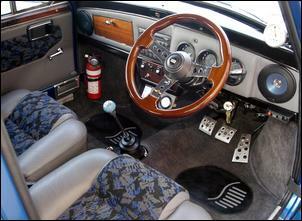 The seats are the original Mini parts with a major re-bolstering job and covered in modern fabric and leather. Further astern, the boot is trimmed in grey fabric and you’ll find a rear-mounted battery and isolator switch. Lex has also installed Cooper S dual fuel tanks. With his tireless efforts and keen attention to detail, it’s no wonder Lex’s Mini has cleaned up at car shows. He’s entered only two shows but already he has a string of awards to his name. And Lex assures us the car is not reserved for ‘occasional use’ - this baby get driven and enjoyed to its fullest. Anything else would be a crime.